When you think Paris, what comes to mind? For me, it’s relaxing mornings where you can smell the freshly baked croissants that just came out of the oven and fresh brewed aroma of coffee. Have it on those traditional romantic balconies – where you just do some reading. Ah it’s just so dreamy! I had to make it a reality and experience it for myself when I was in Paris! And I was able to – thanks to Grand Pigalle Hotel. This is in no way, sponsored by Grand Pigalle. I did some extensive research prior to visiting Paris to find the perfect boutique hotel for the best experience possible. And Grand Pigalle became my first choice! Grand Pigalle is a small boutique hotel located in the heart of Pigalle in Paris. It’s small, but mighty. I loved the vintage romantic vibes through out the hotel! The staff were very helpful and welcoming upon check-in and that’s how I knew my stay here was going to be wonderful. After all, everything about a hotel boils down to hospitality! What more – is that the bed was comfortable. 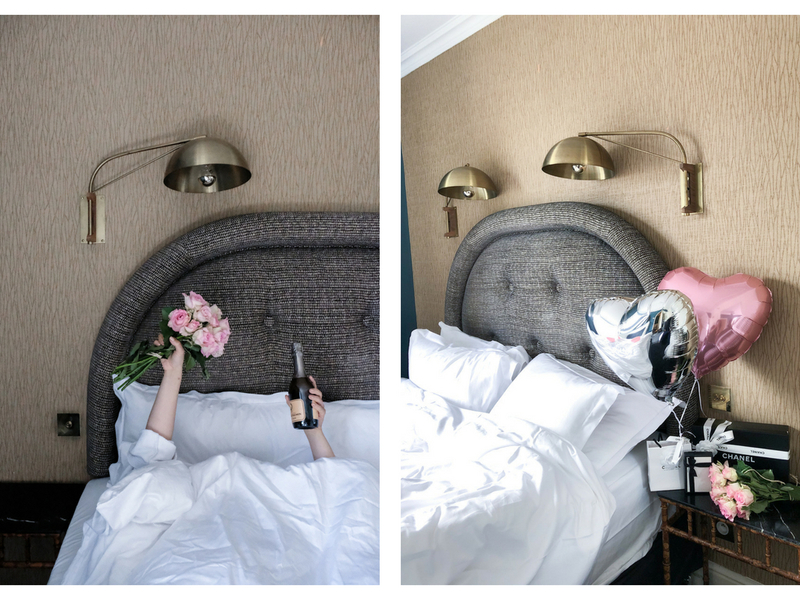 To wake up in Paris with roses, champagne and my favorite designer goodies? Ugh. What a dream. I definitely woke up on the right side of the bed! But truth be told, it was a comfortable bed. I tend to toss and turn a lot and wake up several times when I sleep on hotel beds. But not with this one. I’d say, the bed was medium-hard. Which, was probably more suited for my back and sleeping habits. Actually, this photo was taken straight from my iPhone. No shame. Because, why? It was too good to resist and I failed to take more photos after I posted to my insta-stories. So this is all that I could provide. But hey, better than nothing right? I loved that they had a very hearty and healthy breakfast to help jump start my morning! I woke up here on my last day in Paris, before catching my flight back to New York. This breakfast did not disappoint. The fruits, cheese, cured meats, yogurt, and butter was on point! 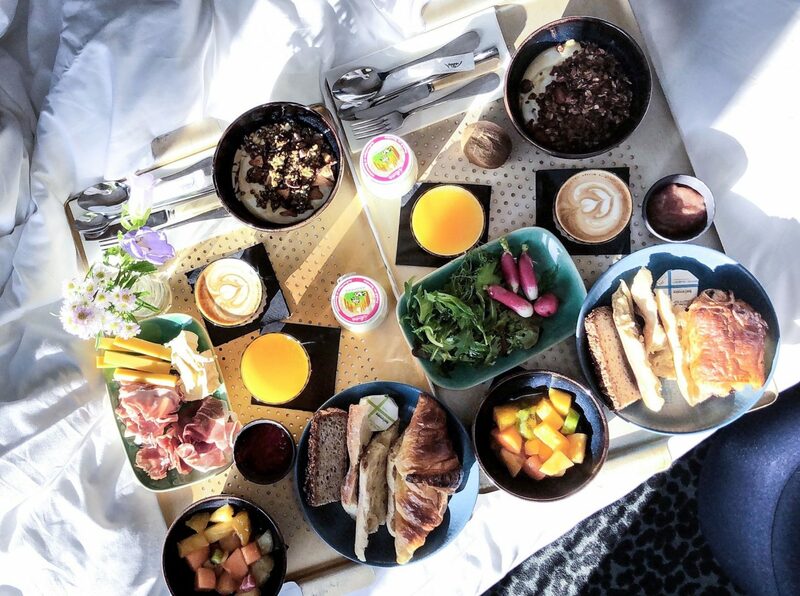 And I loved that they did room delivery for it so I could just enjoy my balcony view while enjoying breakfast! Super relaxing! The balcony is obviously the highlight of this room. It costs an extra €25 per night. But, I think it’s worth every penny – an experience worth paying for! They have balcony rooms in almost every category! So, you can have a balcony room in any price range. My room was the Pigalle Room, so it was the second tier room. It was still comfortable and spacious enough for two! And yes, enjoying some fresh strawberry fraises and cake while trying to figure out how to read a newspaper that’s written in French and people watching was my thing. I promise I’m not a creeper. Anyways, yes. This hotel and this room is the perfect opportunity for relaxation, romance, and beautiful photos to take home. All the photos I was able to take here, was basically a souvenir just for me. Well, and for you guys… since I’m sharing it on my blog and instagram right? 😉 Finding beautiful hotels for photos is definitely something I love to do! The hotel’s decor just has my heart. I can’t even find the words to begin explaining it. 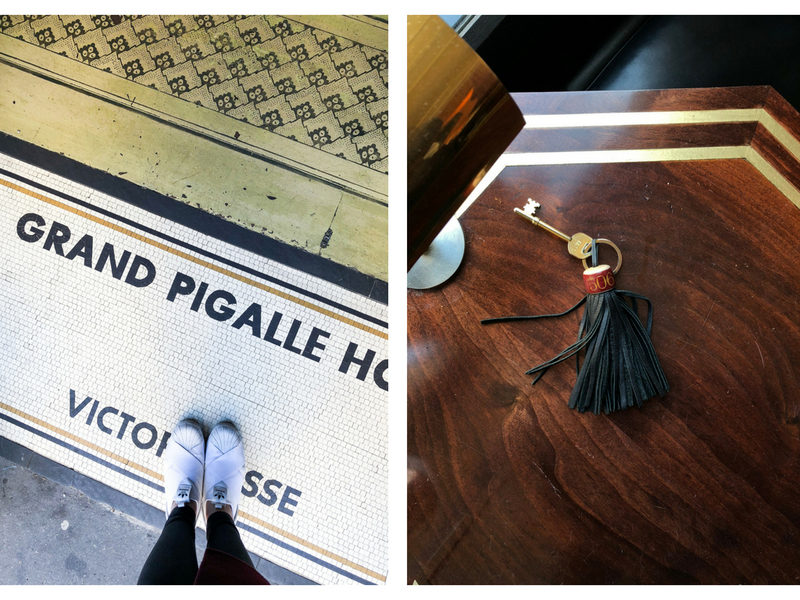 From the moment you step into the hotel, the little tiles on the floor – to the vintage tassled room keys you are given. Then, the Alice in Wonderland-esque turquoise blue stairway. Every little element made it count. If you’re into retro-vintage vibes. This hotel will definitely grab your heart. Overall, I had a great time lounging around at Grand Pigalle. Definitely made my time in Paris extra special. Location: Convenient. It is about 5 minute walk away from Pigalle station. About 15-20 minutes away from most places you would likely travel to. Approximately 30 minutes away from CDG Airport via cab or Uber. Comfort: Clean and comfortable beds. Bed feels medium-hard. Most boutique hotel rooms in Paris, are not very big. However, this one is spacious enough for comfort without feeling cramped. Bathrooms are large with tubs. The open balcony also gives more natural lights and space for more comfort on the eyes. Staff friendliness: Very friendly and accommodating. Always makes recommendations and will help with anything needed. They also store luggage for no fees at all. I loved everyone here! Price: Fair and comparable to surrounding hotels. Hotel prices in Paris are generally on the more expensive side. However, this boutique hotel is good value for what it has to offer. Prices may vary depending on availability and season. CHECK OUT THE HOTEL WEBSITE HERE. Previous Post Paris Trip Designer Shopping Haul + How to Calculate VAT Refund! this hotel is gorgeous! thanks for sharing! Paris looks so dreamy! I bet the view from that balcony was amazing. If I ever get a chance to go to Paris, I’ll look into this hotel. I love the bed with all the flowers. And the balcony was a great choice. I was only in Paris for a few days when I went but I loved it. I know! It’s such a dreamy place! Very relaxing vibes too! What a beautiful place to get away too. I love you pics.. they look amazing! Love the photograph and some cool vibes going on too. The food looks amazing and the place look so comfy! Swooning over this beautiful hotel and its views! Looks like perfection, it’s just so dreamy. These are wonderful photographs. I love the set up you have by the window. I hope I can find the time to go to Paris one day, the architecture is stunning, I love the building you can see from your window! Such a beautiful view and it just has Paris written all over it. That room service is unbelievable!! What a lovely and dreamy Parisian morning! Now, I can only imagine the smell of freshly baked croissants and aroma of brewed coffee! Beautiful post !! the pictures are really dreamy !! and it comes from a french girl ! eheh Thank you for sharing ! What a beautiful hotel, in an amazing location! Everything looks just like you would expect it to in Paris! I would definitely stay here! Wow! you could totally feel how it would be in Paris and the usual experience you’ll have when you’re there thru your photos. Your photos and description of the hotel are very lovely! I would love to experience that kind of room service for breakfast with that balcony. How divine! What an amazing way to wake up!!! I tend to wake up to a cat batting my face! 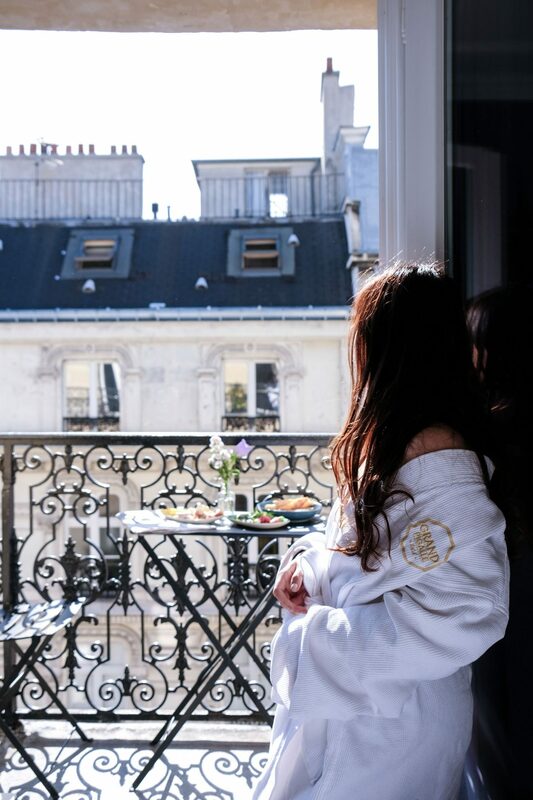 Paris is on my list of places to travel so Grand Pigalle will go on my list of places to stay! Thanks for the info! This hotel looks so lovely! I love the decor and your photos are beautiful! I will definitely keep this in mind for when I visit Paris! You have such a gorgeous view from your room! Definitely the perfect spot to have your breakfast. Gorgeous photos you have here dear. This is so elegant and classy! I love the aesthetic and decor of the hotel and the food looks delicious too 🙂 It’s always lovely when staff are friendly. Great review!!! How regal. I want to visit Paris before I get to a certain age that I will not say, but it is soon. This looks like a great place to be. The balcony is tops. I would LOVE to go to Paris one day. Anytime I think of a hotel in Paris, I always think of those little balconies. ah so dreamy with all the beautiful flowers on the bed. 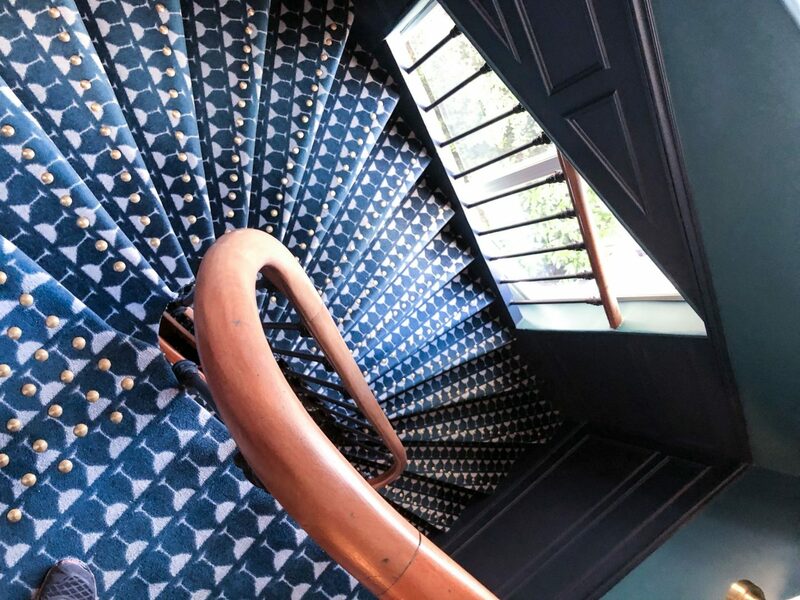 Love the stairs. Paris I guess is the ultimate destination for travelers. I haven’t been there though I hope to go there one day, as of now I’m thankful for this. I get to see the beauty of Paris through your photos. That balcony is amazing. So is the stair case. What a great hotel. I would love to go back to Paris. So gorgeous! I want to go to Paris soon! I love the balcony you have on the hotel it’s so Paris! Loving your photos! I hope you had a wonderful time in Paris!